Are there questions you wished you'd asked? One of the most exciting things that can happen to a family is to discover a previously unsuspected family line - and to celebrate the 13th Birthday of LostCousins on 1st May, I'm making the website FREE until the end of April. This gives you 10 days to make connections with cousins all over the world (around one-third of all the matches at LostCousins involve relatives who live on different continents!). Q What does free mean - after all, the newsletter is free, and it has always been free to search for cousins? Although it's always free to search for cousins, you normally need to be a subscriber to initiate contact with someone new. 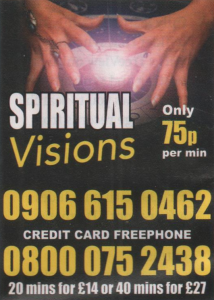 Q How can I best take advantage of this offer - what should I actually do? Searching for your 'lost cousins' is simple - just click the Search button on your My Ancestors page and every relative you've entered will be compared against the millions of relatives entered by other members; you'll find out within seconds whether there are any matches. Naturally, the more relatives you've entered the more likely it is that one of your entries matches one of your cousins' entries. Q Which is the best census to use? The best censuses to use are the ones which are free online. Best of all is the 1881 Census, because that's the one we've been using since 2004 - so it produces 10 times as many matches as all the other censuses added together. enter everyone you can from the 1881 Census before starting on other censuses. Q But who should I enter? It's natural to start with your direct ancestors and their immediate families, but in practice the relatives most likely to connect you to your cousins are the members of your ancestors' extended families - their grown-up brothers & sisters, their nephews & nieces, and their cousins. Q How many people do I need to enter in order to make a match? LostCousins members have between them already entered almost 6% of all the people recorded in the 1881 England & Wales Census - so when you enter someone there's a 6% chance of a match, in other words rather better than the odds of scoring 3 when you throw two dice. The odds aren't so good for the Scotland census, but it's still better than the odds of throwing two sixes. Q Can I tell how the other person is related to me before I contact them? Most of the time you can - just click on their name or initials to view the My Contact page for the relationship. It shows which relatives you've both entered and how you are related to them - and whether the person you've been matched with is a cousin, only related to you by marriage, or connected in some other way. All contacts are worth following up, but you'll probably want to give priority to cousins. Q What if my new cousin doesn't reply before the end of April? So long as you make the match and click 'Make contact' before the end of April it doesn't matter when your relative responds. And if you don't get a response within 14 days there's no need to give up - just ask me to send a reminder on your behalf. Q Is there anything else I should know? The LostCousins matching system has NEVER made a mistake - there are no 'hints', and no 'hot matches', there are only matches. Very occasionally a member has identified the wrong individual on the census - but this is such a rare occurrence that the accuracy rate exceeds 99.8%. Q It all sounds great - but how do you know that any of my cousins are members? If you have mostly British ancestry then statistically there are around 200 LostCousins members who are your 6th cousin or closer - all of them family historians (like you and me). Both Ancestry.com.au and Findmypast.com.au are offering free access to Australian and New Zealand records to commemorate ANZAC Day, which is on 25th April. Both offers start from Friday 21st April and run until ANZAC Day - look out for promotional offers when the free access ends (I'll add them to this newsletter when I get the details so that you can both grab yourself a bargain and support LostCousins). Tip: Australia is around 9 hours ahead of the UK, so by the time you read this newsletter the offers will probably have already started; these offers are not available through other sites around the world, but they are open to all. Tip: Ancestry are only offering free access to 26 million military records, but Findmypast are offering free access to all 96,318,385 records in their Australian and New Zealand collection. If the Ancestry link takes you to the subscription page simply click the Ancestry logo (top left) to go to the home page. 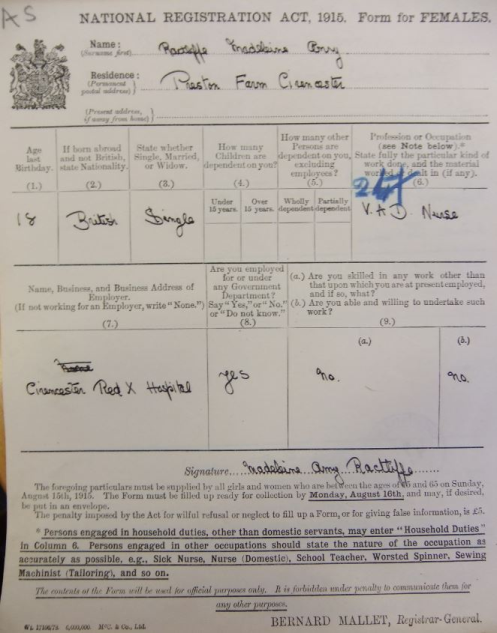 Since the last newsletter I've also been able to confirm that Westminster Archives hold 9 boxes of forms which have not been catalogued, but which are apparently separated into males and females and organised alphabetically. I'm planning to be in London one day towards the end of May, so if possible I'll include a visit to Westminster Archives in my itinerary - but if you’re planning to make a trip before then, let me know, and I'll give you the references under which the records are held. 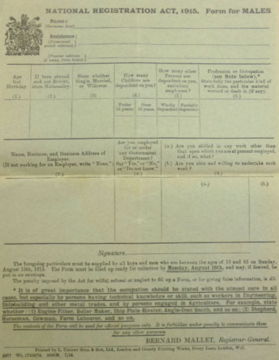 Wiltshire and Swindon Archives also hold an "Indexed register of new registrations in the Pewsey civil registration district", whilst East Sussex hold registrations forms, enumerator's memorandum books, registers of arrivals and new registrations, plus an envelope of posters and forms. They're both places that I'm personally unlikely to visit in the foreseeable future (except, in the case of The Keep, through the pages of Nathan Dylan Goodwin's wonderful novels), so perhaps someone else can take a look? I've also been informed that the Society of Genealogists has the register for Yeovil - and there are more records at Gloucestershire Archives than have already been transcribed. Why not check what your local archives hold - you might make an exciting discovery! The first National Register was a bit of an afterthought - by Registration Day the Great War had been under way for over a year - and it was regarded by some as a failure. A top civil servant, Sylvanus Percival Vivian, wrote a critical report and according to Roger Hutchinson, whose book I reviewed in the last issue, Vivian was appointed Deputy Registrar General at the end of 1919 with instructions to report on the organisation of the General Register Office. However he was told to report direct to the government, rather than via the Registrar General Bernard Mallet (Hutchinson erroneously dubs him Mallett), and this perceived insult resulted in Mallet's resignation. Vivian took over in time to organise the 1921 Census, and he was also responsible for the 1931 Census and the 1939 National Register. Bernard Mallet became Registrar General in 1909 and, with Dr T. H. C. Stevenson (who had been appointed Superintendent of Statistics in the same year), he conceived the idea of introducing questions on marital fertility into the 1911 census in order to test claims by eugenicists that the 'lowest' social classes were out-breeding the middle classes. Bernard Mallet became Life President of the Eugenics Society in 1928 having published a number of articles on eugenics, including one in 1922 entitled 'Is England in danger of racial decline?'. Today we might view that as a racist viewpoint, but in fact it was the poor that he was prejudiced against - he wasn't complaining about migrants or refugees (though no doubt some of them were indeed poor, having lost everything in their homeland), and in fact his own great-grandfather had travelled from France in 1800 to escape the Revolution. "Pedigree stock books are designed for the eugenics of animals, and it is obviously impossible to press the analogy too far in dealing with men and women. It is for statesmen and eugenists to decide what measures can safely and properly be taken to encourage good stock and deter the multiplication of the unfit…." Mallet was railing against families like that of my great-grandparents John Bright and Rose Stevens. The 'fertility census' of 1911 showed that 5 of their 9 children had died (all of them before reaching the age of 5), and 2 of their surviving children were described at various times as feeble-minded or backward. 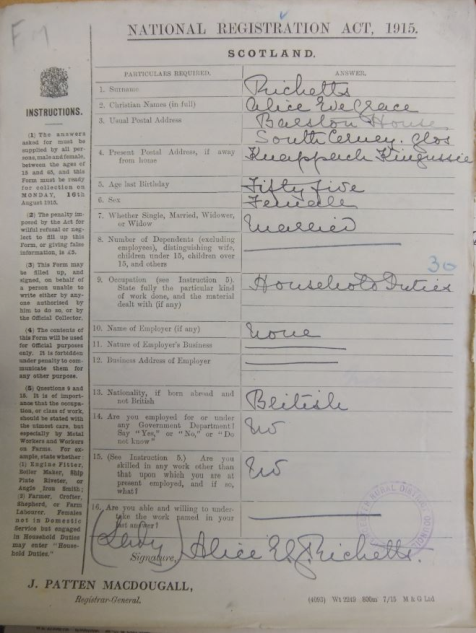 Even my grandmother might have been regarded by Mallet as a burden on society, since at the time of the 1911 Census she was in a lunatic asylum, recovering from post-natal depression. What a family - and yet their great-grandson is a Fellow of the Royal Statistical Society, the organisation of which Bernard Mallet was President from 1916-18. I've even been in a meeting with the current Deputy Registrar General, and I don't think he went away with the impression that I was feeble-minded, at least, I certainly hope not! "….the propaganda machine wrongly gave Germans the feeling that they knew who the real Hitler was. It was dangerous because it made him likeable. People would feel like they knew the true Hitler, the private man behind the Führer mask and that maybe this person was not as bad as all of the news coming out of Europe seemed to suggest." I suspect there are some modern politicians who will also be perceived very differently through the prism of history! If you've read my articles on DNA over the past 10 years you'll know that as better tests and better ways of analysing results have become available I have revised my opinion about the value of DNA testing to the average family historian. I started writing about DNA testing a decade ago, at a time when the only tests available to genealogists were mtDNA and Y-DNA tests, both excellent ways of potentially resolving certain hypotheses about ancestors in your direct male or direct female line, but utterly useless for the remaining 99% of our trees. However, to make those tests appeal to a wider market the companies who offered them focused on their ability to reveal 'deep ancestry', ie where your direct line ancestor would have been living 20-50,000 years ago. In some cases they even purported to tell customers about their ancient ancestors' lifestyles - and gave them names! 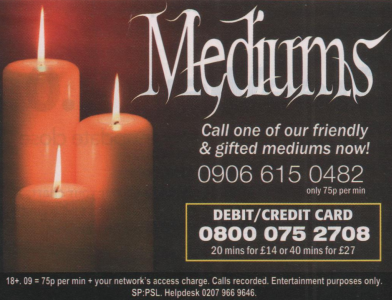 That hocus pocus worked on some people, but not on me. As I explained at the time, if you go back far enough we all share the same ancestors, and whilst there's some dispute as to precisely how far one has to go back to reach that point, it's almost certainly less than 20,000 years. So we're all descended from the same ancient ancestors, just in different proportions, and by different genetic routes. In 2010 Family Tree DNA launched their Family Finder test - it may not have been the first autosomal DNA test, but it was the first one that came to my notice (thanks to Katherine Borges, Director and co-founder of the International Society of Genetic Genealogy). Autosomal DNA is passed on by both parents to all of their children, so it can potentially tell us about any of our ancestral lines, although in practice its reach is only about 250 years. Nevertheless, that timescale takes in sufficient of my 'brick walls' to make it very interesting - the downside is that the segments of DNA aren't labelled, so we don't know which ancestral line they came from. So the testing companies came up with another wizzy idea, which was to deduce our ethnicity from our atDNA. This worked fairly well for inhabitants of the New World whose ancestors came from different continents, but for those of us in Britain discovering that our ancestors came from the British Isles or Western Europe didn't really enlighten us - particularly since the results weren't consistent between siblings or between testing companies (some of you might remember my article Don't expect meaningful DNA results from last June). The problem with those sorts of analyses is that their accuracy is dependent on the representativeness of the reference populations - and this is why everyone was so excited when Living DNA announced last autumn that they would be using data collected during the People of the British Isles project, because they are able to break down the British Isles into 21 areas (you can see my results here). Ancestry DNA have taken a slightly different approach, using data submitted by their own users to come up with Genetic Communities. I can't judge yet how well this is going to work, because my brother (who is the only member of my family to have tested with Ancestry so far) has only been allocated to one of these communities, Southern English, but I'm sufficiently enthused that I'm going to test with Ancestry myself the next time they have a sale. Family Tree DNA have recently updated their myOrigins feature, but so far I'm underwhelmed by what I've seen - they seem to have some catching up to do. Of course, the main reason most of us test our DNA is to find living cousins and knock down 'brick walls'; if the hints we get from the various analyses of our ethnicity help us to knock down 'brick walls', that's a bonus. FTDNA are slashing $20 off the price of Family Finder, bringing it down to just $59 (plus shipping), and there are also reductions on most of their Y-DNA and mtDNA tests. The offer starts today and ends at 11.59pm (Central Time) on 27th April - please click the banner or link above so that you can support LostCousins. Tip: you can test with Ancestry and transfer your results to Family Tree DNA - but you can't go the other way. The first recorded reference to the church of St Michael's Bassishaw in London's Basinghall Street dates from 1196; sadly it was one of many churches in the City of London to be destroyed in the Great Fire of London. Rebuilt between 1675-79, it was eventually demolished in 1900 and the site now forms part of the Barbican complex. This certificate was issued in 1810 and, as it happens, was certified by the same curate who presided over the ceremony in 1805 - though it would have been equally valid had it been signed by his successor. Note the embossed stamp in the top left hand corner - you might just be able to make out the words FIVE SHILLINGS. This was a large sum of money in those days - more than a day's pay for the average worker - so I don't suppose many certificates were purchased. In fact, it makes the £9.25 that the GRO charge seem relatively modest! Do you have an older certificate in your collection, and if so do you know the circumstances in which it was issued? Note: I have seen one older certificate, but it relates to a clandestine marriage - in Mark Herber's Ancestral Trails there is a photograph of a 1738-39 certificate (held in the National Archives). This week the death was reported of Emma Morano, who was born in Italy on 29th November 1899 - she was the last person alive to have been born in the 19th century, and one of relatively few people to have lived in three centuries. A quick search at Findmypast reveals that there were 46 people recorded in the 1901 Census who were aged 102 or more, and thus born in the 1790s, though I suspect that a thorough examination would reduce the numbers somewhat. Coincidentally my last newsletter featured a photograph of another woman who lived in the 19th, 20th, and 21st centuries - the bride in the wedding photo is Grace Violet Goodfellow, who was born on 29th March 1899, married in 1928, and died on 13th July 2000 aged 101. It makes it particularly poignant that her family photographs ended up being bought by a stranger. Do you have anyone in your family tree who lived in three centuries? Note: for the purposes of this article I'm assuming that the 20th century began on 1st January 1900 (as most people now think), not 1901 (as some would argue). For a discussion of the topic see the letters published in The Times on 1/1/1900. If only we'd asked the right questions when we were younger! So often we're faced with 'brick walls' or other conundrums that could easily have been knocked down had we thought to ask relatives from earlier generations when they were still around - just knowing that someone spoke with a particular accent might save us hundreds of hours of fruitless research. This is not an endorsement - personally I'd rather spend my money on a DNA test, or employing a professional genealogist. But I do wonder whether anyone has ever knocked down a 'brick wall' after consulting a medium…..
A married couple in Mississippi who visited a fertility clinic discovered that they were twins! Both were adopted as infants after their parents died in a car crash, but neither was aware that they had a twin. You can read more about this story in the Mississippi Herald. This story is actually a hoax - indeed the Mississippi Herald doesn't exist. Nevertheless given the multiplicity of ways that babies are now conceived I suspect that one day it will be routine to take DNA tests before marrying - just as it was once necessary to take a blood test in the US. In December 2015 the Office for National Statistics published an analysis of births in England & Wales between 1995-2014 which concluded that 26th September was the most popular birthdate - indeed, late September and early October are generally popular (it must be something to do with those long winter evenings). Earlier this year Significance magazine published an extended analysis which covered the 36 years from 1979-2014: the results were broadly similar, though the most popular date for this longer period was a day earlier - 25th September. But the researchers also noticed that births dropped significantly between 24th-27th December - and that births were lower on Sundays than any other day of the week. Indeed in most years there were, on average, fewer births on Sundays than on public holidays - which seems surprising at first, but perhaps isn't so surprising when you consider that most public holidays fall on Mondays. To the best of my knowledge I don't have any direct ancestors who served in the army prior to the First World War, and after reading Simon Fowler's excellent book I'm not surprised - if you didn't get killed outright by the enemy the chances were that you'd die of your wounds, or from dysentery, cholera, typhoid or one of the other diseases that caused needless deaths. Things changed a bit when Florence Nightingale got involved in the Crimea but, even so, it wasn't until the Great War that more men were lost to the enemy than to generally preventable diseases. 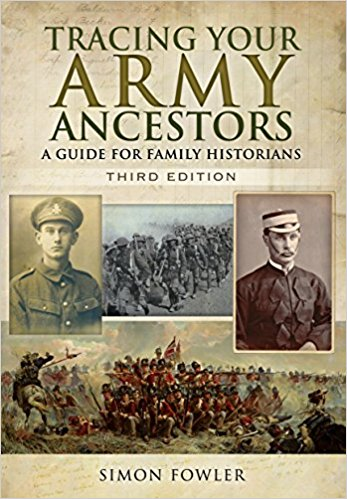 Now in its 3rd edition, Tracing Your Army Ancestors: a guide for family historians is amazingly comprehensive: the 17 chapters and 4 appendices take us through the surviving records chronologically, geographically, by rank, and by gender, as well as focusing on key topics like pensions & pensions records, discipline & desertion, casualty records, and medals & other honours (including mentions in dispatches). There are also guides to army numbers and the way that the army was organised at different times in our history - overall the book covers the best part of 500 years. Not only do we learn what there is, we find out what there isn't - either because it hasn't survived, or because it wouldn't have been recorded in the first place (for example, war diaries are a fairly recent invention). Many of you will be appalled, as I was, to discover that the system of purchasing commissions was not abolished until 1871, even though a Royal Commission concluded in 1856, after the Crimean debacle that it was "vicious in principle, repugnant to the public sentiment of the present day, equally inconsistent with the honour of the military profession and the policy of the British Empire and irreconcilable with justice." Even as late as 1902 an officer needed a private income - pay was still based on rates laid down during the Napoleonic Wars - but on the other hand, during peacetime their duties were undemanding and they probably spent more time wining & dining, flirting and hunting than soldiering. Amazingly, all this information is crammed into fewer than 200 pages, so you really can do what I did, and read it through from beginning to end - I certainly learned a lot, and I suspect you will too. For some readers the 5 pages on problem-solving alone will more than justify the modest cost of the book - the cover price is £14.99, but when I checked just now it was available for as little as £10 (including shipping within the UK). Don't be tempted to buy an earlier edition - an enormous flood of military records have become available over the past few years, partly because of the WW1 Centenary. Note: the book is already out in the UK, but is not due for release overseas for another few weeks. Although it's now three years since the 3rd book in Steve Robinson's series of genealogical thrillers was published, it's a particularly appropriate time to belatedly publish my review which, thanks to the release of the The Last Queen of England coinciding with the inaugural Genealogy in the Sunshine event, wasn't published at the time. Why is now a good moment? 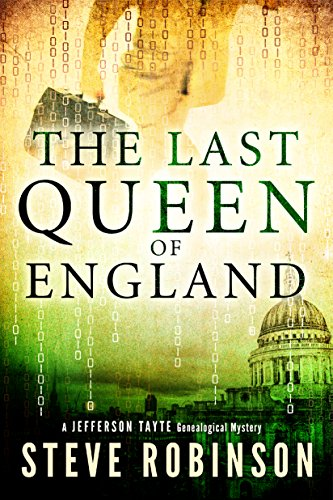 Primarily because it is in this book that Jefferson Tayte first meets two of the key characters in the latest book, Dying Games (which I reviewed in the last newsletter), but also because you can currently buy the Kindle version of The Last Queen of England for the trivial sum of 99p! The Royal Society was founded in 1660 - its Latin motto, "Nullius in verba" is generally translated as "Take nobody's word for it", in other words don't believe anything unless it is supported by evidence. A fine motto for any researcher, but a particularly appropriate motto for genealogists, don't you think? I won't be giving too much away when I tell you that at the heart of the book are murders that appear to be linked by their ancestors' membership of the Royal Society at a time when Queen Anne was on the throne - it was during her reign that England and Scotland joined together to create the kingdom of Great Britain, making her both the last Queen of England and the first Queen of Great Britain. Jefferson Tayte has flown into London to attend a genealogy conference - and takes the opportunity to meet up with Marcus Brown, an old friend who has recently retired from a senior position at the National Archives. But things don't go to plan, and before long JT is helping the police with their enquiries - the question is, can he make the connection between the murders and predict who the killer's next victim might be? The story moves at such a cracking pace that it's almost impossible to put the book down - but just when you think you've got it all worked out, the author puts another twist in the tale. It's great fun, as we have come to expect from Steve Robinson, even though I doubt there is a professional genealogist alive who has been in as many scrapes as JT! Two weeks ago unidentified remains were found in the graveyard of St James, Stanstead Abbotts, in Hertfordshire - not far from where Jefferson Tayte's creator used to live. The churchyard was cordoned off and the police set up a forensic tent to protect the site, as you can see in this article from the local paper - and there was speculation that the remains were human (perhaps not surprising, considering it was a graveyard). I did wonder for a moment whether it might the basis of a new Jefferson Tayte mystery? But now the truth has come out - and it's a sad, sad story. You can read all about it here. Also in the news this week were 5 former Archbishops of Canterbury, whose remains were discovered beneath a medieval parish church next to Lambeth Palace, according to this article on the BBC website. There are certainly some strange names on the London Underground map, and in this BBC article you can find out how 10 of them acquired their monikers. Note: following my article about the Metropolitan Police pension records I had an email from Richard, who told me that PC George Dixon was named after the school he attended, which was also the alma mater of the producer of 'The Blue Lamp', Michael Balcon; George Dixon Grammar School for Boys was itself named after a Birmingham MP. I hope you enjoyed this edition - I'm sorry that there wasn't room for Peter's Tips on this occasion, but trust me, it will be back again very soon!